(Next time I am using a milder, less fatty sausage, maybe something like mild Italian sausage or turkey sausage). ****Known IC irritants, tread carefully! Adjust oven rack to upper-middle position, place rimmed baking sheet on rack and heat broiler. Microwave peppers until just tender 3-6 minutes. Heat 1 tsp. oil in large skillet over med-high heat until just smoking. Add beef, sausage, and onion, cook until beef is no longer pink, about 5 minutes. Stir in rice and hot sauce and cook until heated through, about 2 minutes. Off heat, stir in 1 cup cheese and season with salt and pepper. Pat peppers dry with paper towels and season with salt and pepper. Carefully brush preheated baking sheet with remaining oil (we saved calories and used PAM spray). 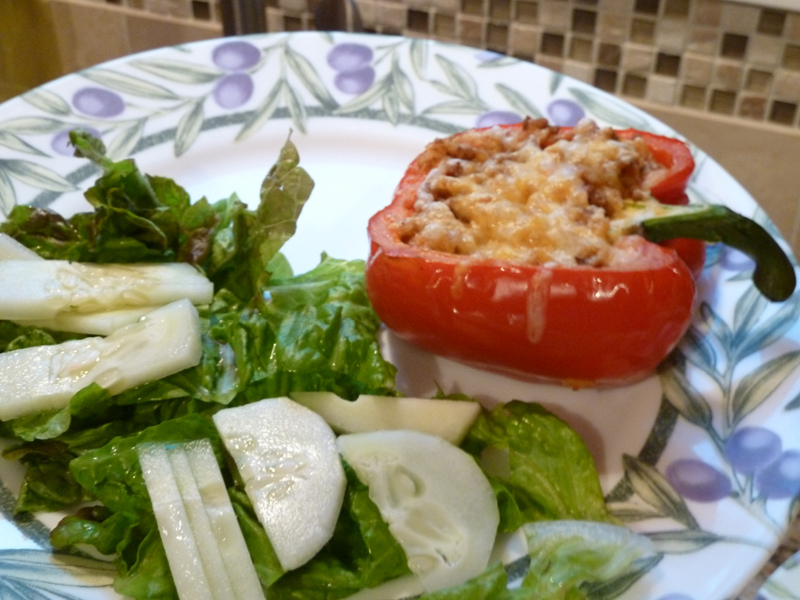 Place peppers, cut size down, on baking sheet and broil until spotty brown, about 3 minutes. Flip peppers and fill with beef mixture. Broil until cheese is spotty brown, about 5 mins. Serve. 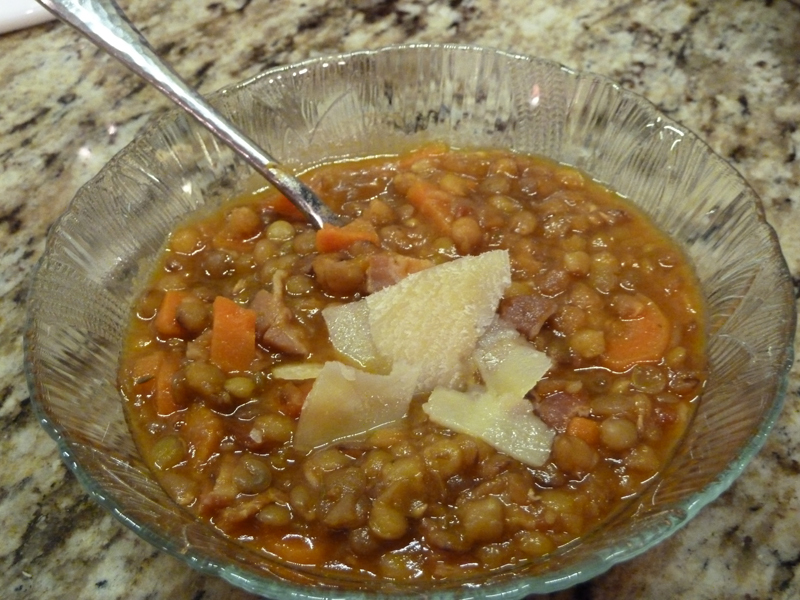 This is a very healthy lentil soup that I plan on making again soon. It can either be made with bacon or ham, either way you’ll love it! I found I had to add additional water. Add a few stalks chopped celery, if you like (It’s a great addition). 1 1/2 cups lentils, picked over and rinsed**? In a Dutch oven or other 5 qt. pot with a tight-fitting lid, cook the bacon until brown and crisp, 8-10 minutes. Pour off all but 1 T. of the fat. Add the onion and carrots (and celery if you desire); cook until softened, about 5 minutes. Stir in garlic, and cook until fragrant, about 30 seconds. Stir in tomato paste, and cook for 1 minute. Add lentils, thyme, broth, and 3.5 to 4 cups of water. Bring to a boil; reduce to a simmer. Cover; cook until lentils are tender, 30-40 minutes. If the soup becomes too thick during cooking, add up to 1 cup more water. Stir in vinegar, 1.5 tsp of salt, and 1/4 tsp. pepper. Serve the soup immediately. This is one of my favorites. It’s flavorful and tastes gourmet. It’s from the book “The Best Simple Recipes” by America’s Test Kitchen! 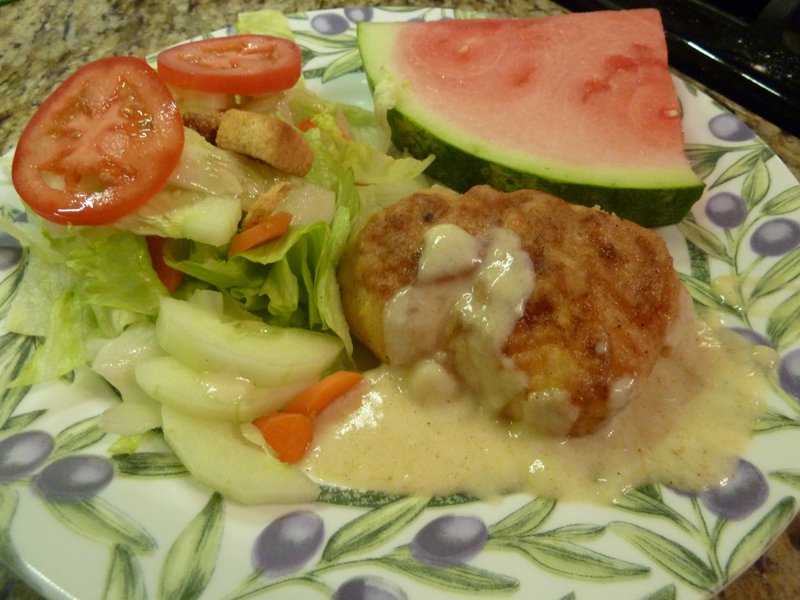 They cut back on the cream and brightened the flavors of the rich sauce with lemon. A+! 2 boneless, skinless chicken breasts (about 3/4 lb. ), cut crosswise into 1/4″ thick pieces. Bring 4 qts. of water to a boil in a large pot. Meanwhile, pat chicken dry with paper towels and season with salt and pepper. Melt 1 T. butter in large skillet over medium-high heat. Cook half of chicken until no longer pink, about 3 minutes, transfer to plate. Repeat with remaining butter and chicken. 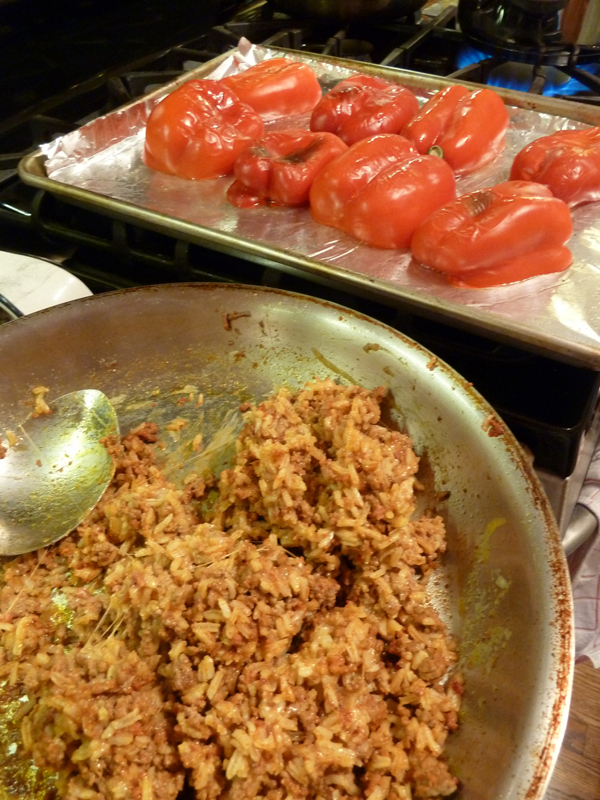 Add garlic to empty skillet and cook until fragrant, about 30 seconds. Stir in cream, lemon zest and juice, simmer until sauce is slightly thickened, about 5 minutes. Remove from heat and cover. Meanwhile, add 1 T. salt and farfalle to boiling water and cook until al dente. 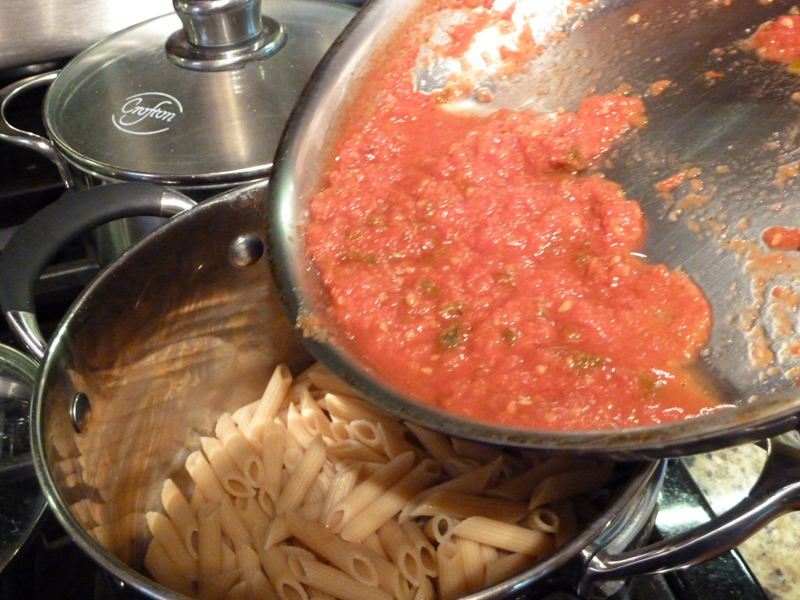 Reserve 1/2 cup cooking water, drain pasta, return to pot. 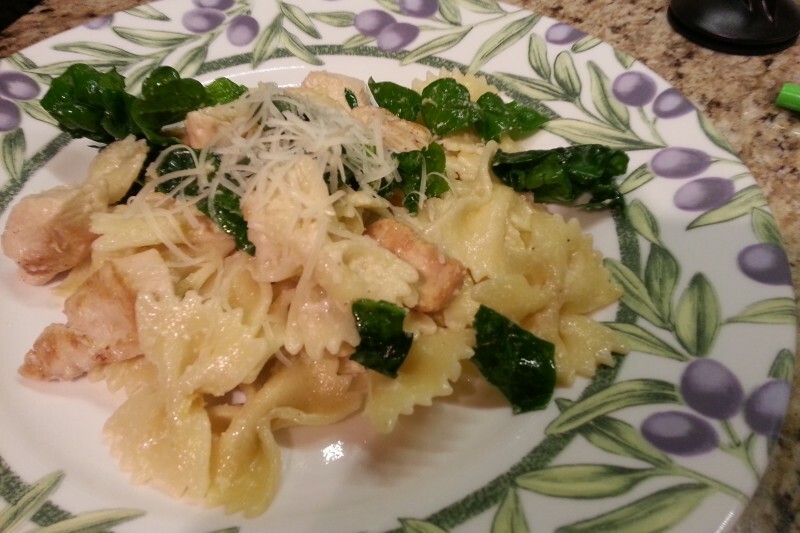 Add sauce, spinach, Parmesan, pine nuts, and cooked chicken to pot and toss to combine, adding reserved pasta water as needed. Season with salt and pepper. Serve. 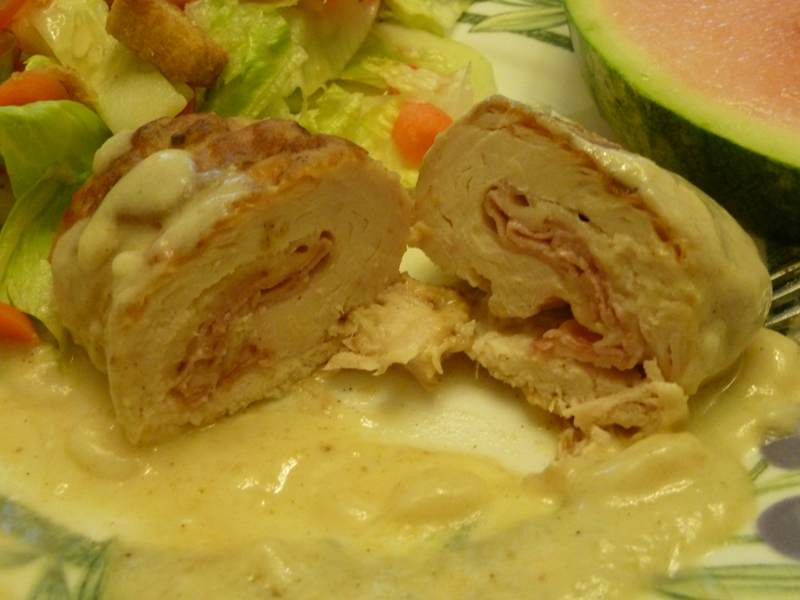 I have always wanted to make chicken cordon bleu myself and finally did it, this time in the slow cooker! It is definitely not healthy for you, but I figured I’d make it about 1-2x a year and if I made it, I will have known the exact ingredients in it (no preservatives and fake chemicals) versus buying it frozen or in most restaurants. This came out of my Crock Pot Favorite Slow Cooker Recipes Book (c) 2010. It is really tasty. It IS on the heavy side so just eat less of it! Makes 4 servings. ENJOY! Combine flour and salt in a resealable plastic bag and shake well, set aside. Place flattened chicken on cutting board, skin side down. Please 1 slice ham and 1 slice cheese on each piece. Fold chicken up to enclose filling and secure with toothpick. Place in bag with seasoned flour and shake gently to coat. Heat oil in large skillet over medium-high heat until hot. Add chicken, skin side down. Brown on all sides. Transfer to slow cooker. Remove skillet from heat and add chicken stock. Cook and stir to loosen browned bits (A.K.A. Deglazing). Pour into slow cooker. Cover and cook on LOW 2 hours. Remove chicken with slotted spoon. Cover with aluminum foil to keep warm. Mix together half-and-half and cornstarch. Add to cooking liquid. Cover, cook on LOW for 15 minutes longer or until sauce has thickened. To serve, remove toothpicks, place chicken on plates and spoon sauce around chicken, with extra sauce if desired. 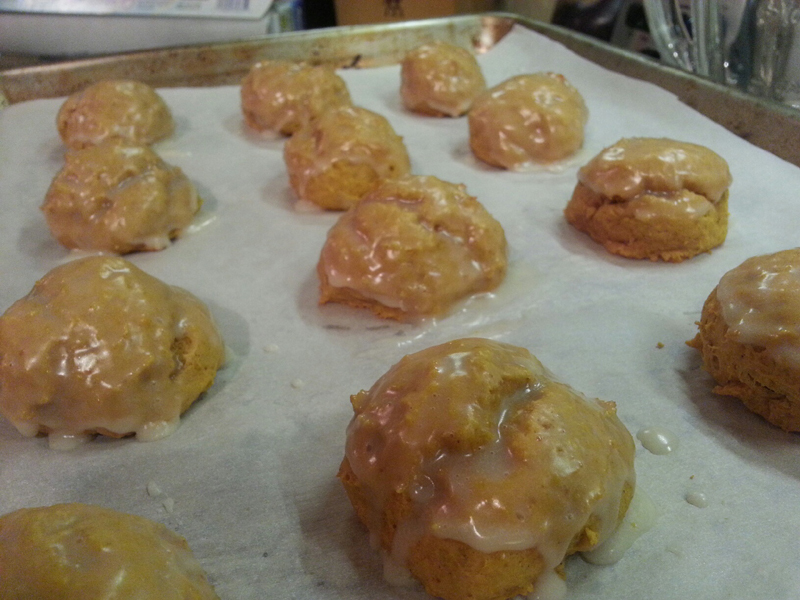 These are a great pumpkin treat for this time of year AND they get a vegetable in you and/or your children. What is interesting is that they are not overly sugary, they almost taste a little too healthy without the icing, but they are great! Baking on parchment paper is always something I recommend. I froze the remainder since it made 2 dozen cookies. This is from the book “The Food Allergy Mama’s Baking Book” by Kelly Rudnicki. **Known IC irritants, tread carefully! Omit spices that bother you. Shortening can have soy and other irritants, replace with butter. In the bowl of a stand mixer fitted with the paddle attachment, thoroughly combine the shortening, sugar, applesauce, and pumpkin. In a separate medium bowl, combine the flour, baking powder, cinnamon, nutmeg, ginger, and salt with a wire whisk. Add the flour mixture to the shortening mixture and stir until just combined. Line 2 baking sheets with parchment paper. Use a cookie scoop to place batter onto the prepared sheets. Frost with icing recipe below. 3-4 tablespoons milk, as needed to thin icing. Blend all ingredients together in a small bowl with a wire whisk. Drizzle over cookies or dip each cookie into icing bowl. 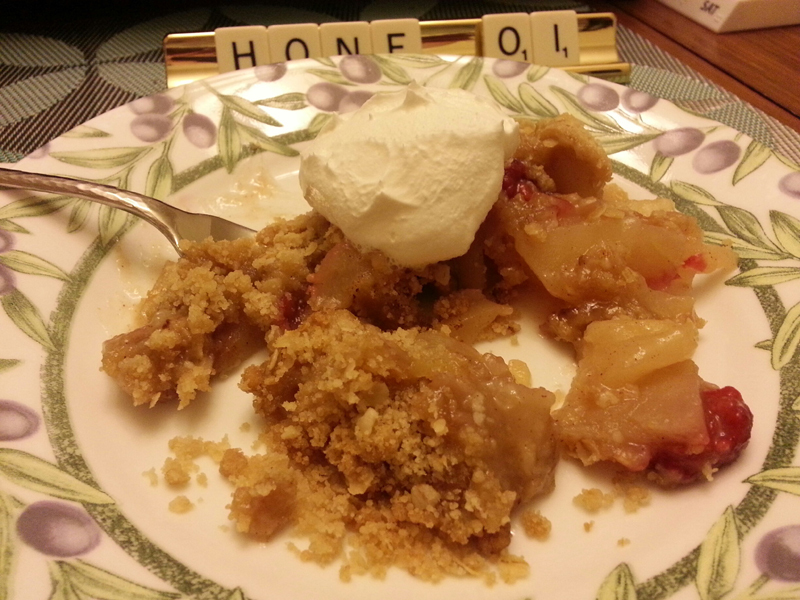 This is a wonderful recipe I adapted, it just comes out perfectly and is healthier (even though it’s still a dessert) than a traditional apple pie because it is lacking the caloric crusts. Galas or honey crisp work especially well here. ENJOY! 1 cup brown sugar (You can get away with 3/4 cup here to reduce the sugar; I’ve done it successfully). 1/2 cup quick oats, optional but healthier! **Make this IC safe by removing the cinnamon. Omit raspberries if they bother you. Preheat oven to 350° degrees F. Grease a 8×8″ to a 10×7″ (approximately) pan. The size doesn’t matter, it just may take longer to cook in a smaller pan. (I used a glass pan). Place apples in prepared dish. Sprinkle raspberries randomly in the dish. Sprinkle with cinnamon. Pour water over the entire thing. In a bowl, cream sugar and butter together. You can use a mixer or your clean hands. Gently blend in flour and quick oats. Sprinkle this mixture evenly over apples. Bake in preheated oven 30-40 minutes until apples are tender and crust is golden. Mine usually takes 40 minutes. This was a recipe from an All Recipes magazine that I don’t subscribe to, but got free in the mail. I didn’t have, and couldn’t find, snow peas, so I used broccoli. The sauce is the biggest winner in this recipe. Most commenters double the sauce and so did I. The following recipe has doubled sauce ingredients. It would have been great on a bed of rice, but it was a LONG day. It calls for fresh ginger root but I hate wasting the remainder whenever I buy it, so I just used a few dashes of powdered ginger. I hate the way round steak usually turns out so I used a higher quality cut of beef. Enjoy! 2 tablespoons brown sugar (I used 1 T.; it was fine). 1-2 tablespoons vegetable oil, as desired. 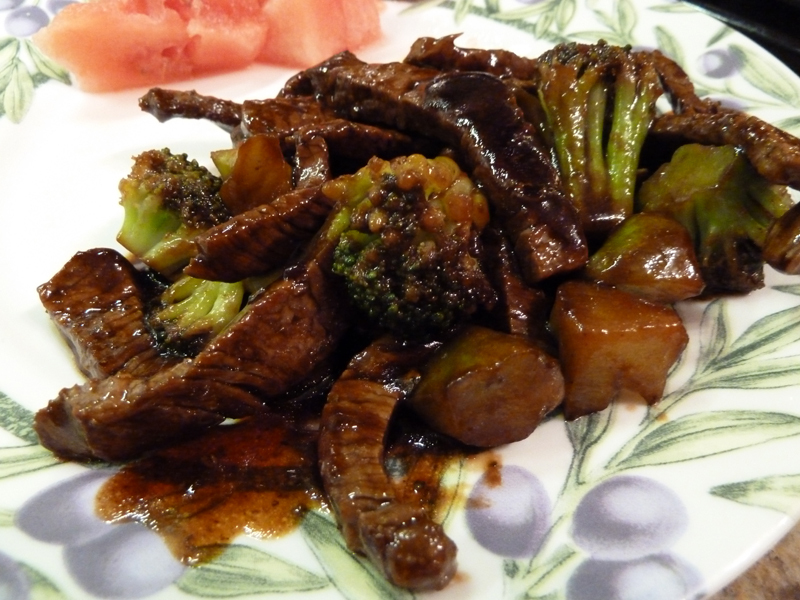 In a small bowl, combine the soy sauce, rice wine, brown sugar, and cornstarch; set aside. Stirfry ginger and garlic for 30 seconds. Add the steak and stirfry for 2 minutes or until evenly browned. Add the snowpeas and stirfry for an additional 3 minutes. Add the soy sauce mixture; bring to a boil, stirring constantly. Lower heat and simmer until the sauce thickens, about 1 minute. Serve immediately. This recipe involves the blender and simple simmering and reduction. You can change up the spices as you like. 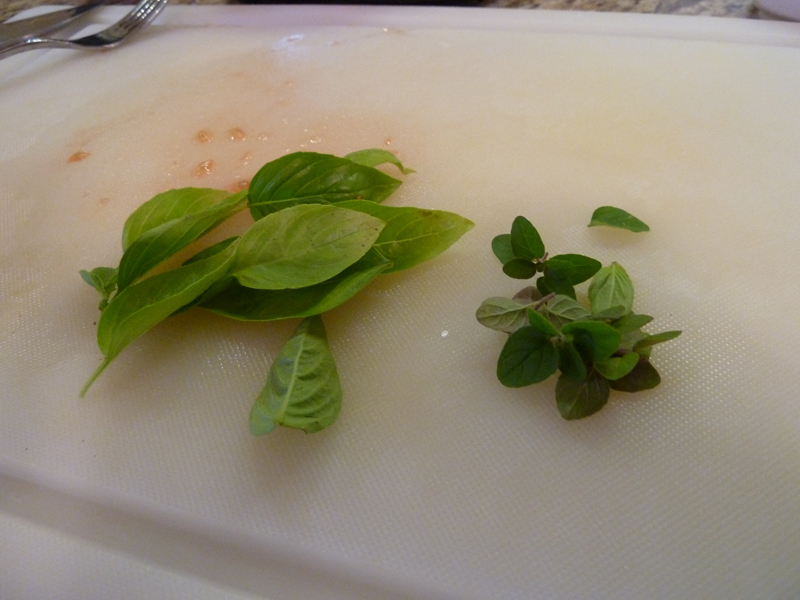 I used fresh oregano and basil from the garden. I added garlic and onion powder and some generic Italian type seasoning. For not having any preservatives or chemicals, this is a WIN! 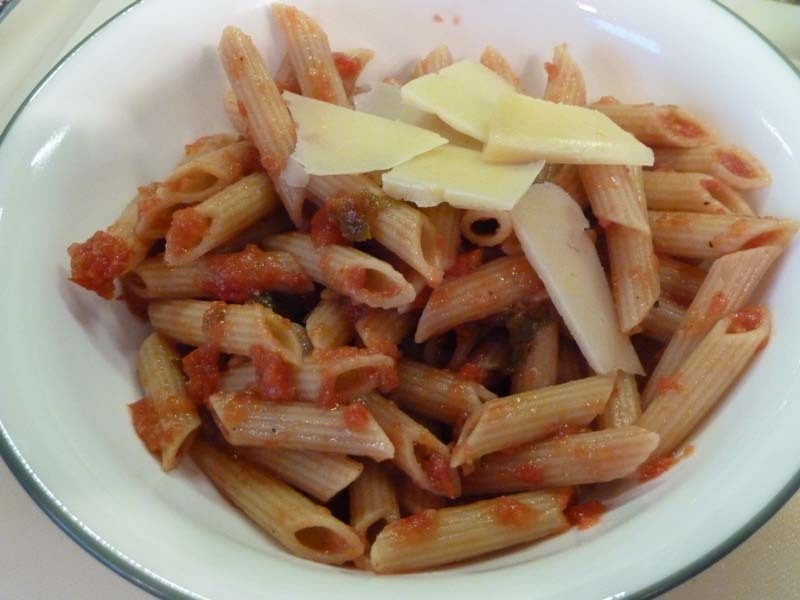 Mix with some whole wheat pasta and you have a healthy side to your meal. Begin by cutting out a tiny amount of the tomato: cut out the top woody party of the tomato and a thin layer including the stem. Roughly chop remaining tomatoes and put in blender. Add salt/pepper and basic spices that you chose. Pulverize in blender until smooth. Transfer to skillet and reduce this pink, liquidy mixture until it turns into a pasta sauce consistency, watching not to let it burn, about 20-30 minutes.